TheDIYLady gets fancy with Zoya Fall 2013 PixieDusts - Nail Art Galore!!! Today's post is a Nail Art Spam! Yesterday I posted my swatches and review of Zoya's Fall 2013 PixieDust Collection, and today I have some nail designs to show you all. These are all simple DIY designs that can be easily done to add an extra pow pow to the already beautiful polishes. I'm not the greatest at drawing, but nail art embellishments help me create designs I like. I did all these while swatching the polishes and I decided to put them all in one post instead of making multiple posts. To avoid repeating myself several times, I used clear polish to place all of the rhinestones on my nails. For some, I added topcoat to seal it all, and for some, I just left them alone so that the textured look of the polish remains. First up is Zoya - Tomoko and some gold rhinestones. Here's tomoko with Topcoat all over. For this next one, I used striping tape! I wanted each nail to look like my pointer finger, but THAT one was almost a disaster. I forgot which tape I put last on the nail and made some smudges, so I decided to do simple french tip and left my ring finger alone. Topcoat on only the pointer finger. Next up is Chita. A simple bow on my ringer finger, and each nail has a topcoat to show you what this looks like with topcoat. The sparkles are too cute in this! Next is Zoya - Carter. Random Rhinestone design on this one. Topcoat on all nails. Next up is Zoya - Arabella! This is so pretty I didn't know what to do with it. Below I have topcoat on just the ring finger. Here each nail has topcoat on it. I also whipped out Zoya - Charisma and left the accent of Arabella. Charisma looked amazing with topcoat on! And lastly, here's a mani I did for a baseball game I went to. The stamp on my ring finger was done with Zoya - Rekha. Hope you like at least one of these designs? CLICK HERE to view my swatches of these polishes without nail art. 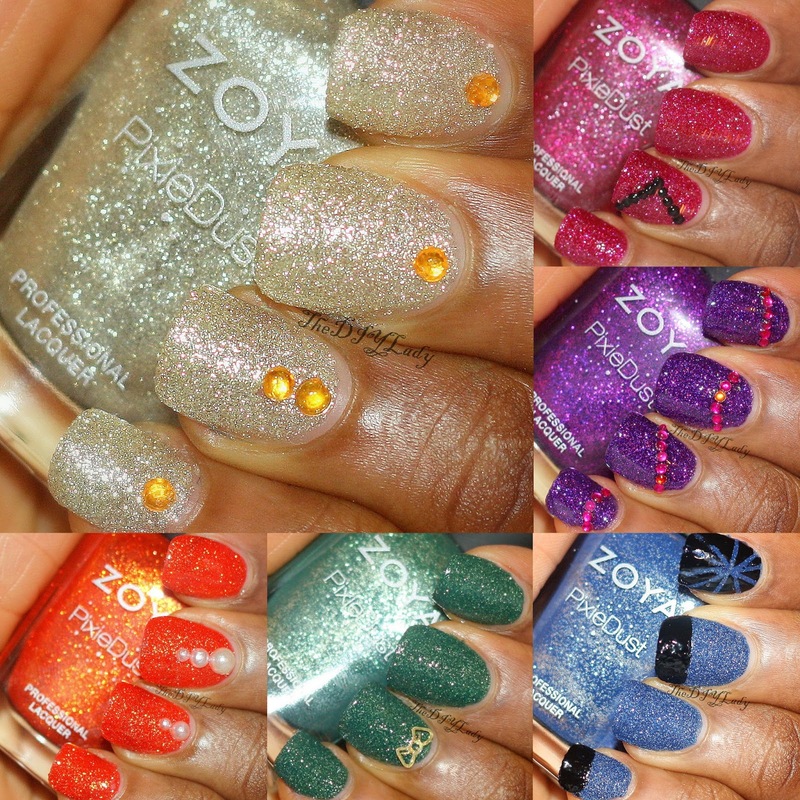 Love the polishes or want to check out more polishes by Zoya? You can get them at $9 each on Zoya's Website or at your local ULTA stores. Some products used in this post were provided for my honest review. Opinions are 100% mine. Dhara with pearls is gorg! Beautiful! I love how you did this post with the nail art! Great swatches! Loving the nail art too! The purple looks so good on you!! Pretty pretty! I think the design with Carter is my favorite!